The competition continues on Monday 4th December with two matches in Pool B. Reigning world and Hockey World League champions Australia face England at 1730 Indian Standard Time (UTC: +5.30) before home favourites India take on pool leaders Germany at 1930. Belgium continued their excellent start to the Odisha Men’s Hockey World League Final 2017 event, claiming a second successive victory to take control of Pool A at the end of Day 3 in Bhubaneswar, India. 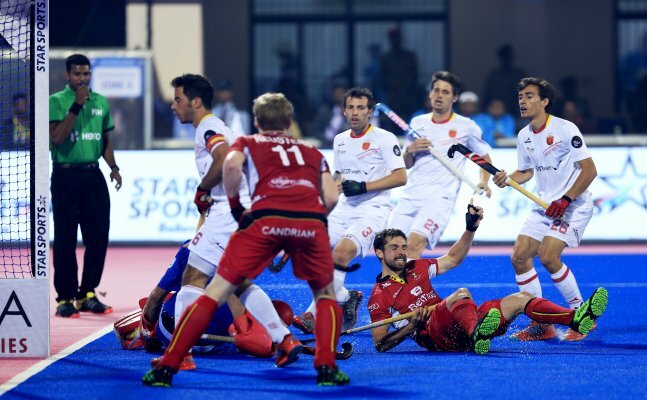 Belgium’s Red Lions (FIH Hero World Ranking: 3) claimed a 5-0 win against the Red Sticks of Spain (WR: 9), adding another three points to those collected in Saturday’s triumph over Olympic gold medallists Argentina. While the Belgians were seen as the pre-match favourites, Spain’s impressive win over the Netherlands on Saturday ensured that they had good reason to feel confident about their own prospects. Belgium needed just three minutes to make the first mark on the scoreboard when Floren van Aubel dived at full stretch to squeeze in a shot from a tight angle, making the most of an opportunity created by Red Lions captain Thomas Briels. Spain gave as good as they got in their opening two periods before Loick Luypaert netted a rasping penalty corner drag-flick midway through the third quarter to give Belgium breathing space. Three goals in the final three minutes of the match perhaps gave a rather flattering look to the score-line, with Luypaert completing has hat-trick with a penalty corner and a penalty stroke either side of an open play effort from the ever impressive Cedric Charlier. The result put Belgium onto six points in Pool A, ensuring that they would finish the day three points clear of their nearest rivals even before the start of the evening match between Olympic champions Argentina and European champions the Netherlands. Talented Dutch youngster Thierry Brinkman showed a killer instinct in front of goal in the 12th minute, smashing home the opening goal of the game with a wonderful first time strike past onrushing Argentina goalkeeper Juan Vivaldi. It was a challenge that Los Leones accepted wholeheartedly, dragging themselves level with two improvised goals following mis-trapped penalty corners. Matias Rey netted just before the end of the third quarter, with the influential Lucas Vila brilliantly converting a close-range deflection into the top corner with ten minutes remaining. The Netherlands moved back ahead with five minutes left to play when Mirco Pruijser scored from a penalty corner, but Argentina refused to be beaten and claimed a dramatic 3-3 draw thanks to yet another crucial penalty corner strike from Gonzalo Peillat with less than a minute remaining. It was a fitting conclusion to a thrilling game that was enjoyed by another big crowd at Bhubaneswar’s Kalinga Stadium, although the result left both teams in the bottom half of the Pool A table. Pool A: Belgium 5, Spain 0. Pool A: Netherlands 3, Argentina 3.